In the late 21st century, humankind has given up on its dreams of one day traversing the stars in glorious rocket propelled ships, largely due to the ease of life provided by T-Mat. Similar to the transporters made famous on Star Trek, T-Mat is an instantaneous form of matter transference which enables people and objects to go anywhere they want to on the planet. But when the T-Mat relay station on the moon breaks down, the folks in charge depend on a curmudgeonly old scientist (who has secretly been building a rocket in the hopes of rekindling interest in the space program) to get them to the moon to fix the problem. But with no trained astronauts, who can man the mission? Since you're reading a Doctor Who review, you've probably already guessed the answer. The Doctor (Patrick Troughton) and his two companions, Jamie and Zoe, have conveniently arrived in the TARDIS and volunteer to fly the rocket. Unbeknownst to them, the lunar T-Mat relay station has been overtaken by Ice Warriors from Mars, who intend to utilize the teleportation system to deliver seeds to various locations on Earth. Once there, the seeds will release a fungus that will render life on Earth uninhabitable by humans but perfect for Martians. Action and adventure of an incredibly dull and slow-paced variety ensue as the Doctor and his companions race to save the planet. Originally airing in six weekly installments between January 25 - March 1, 1969, The Seeds of Death (Story #48) is my first brush with Patrick Troughton, the Second Doctor, and one of the more interesting, albeit incredibly long and somewhat boring, Doctor Who serials I've seen. Now, this being Doctor Who, it goes without saying that the writing is good. The program, which seems to have begun airing somewhere around the Jurassic period, consistently impresses me with its intelligent interpretation of science fiction, even when the overall product isn't entirely amazing, as is the case with The Seeds of Death. I know that it may sound like I'm talking out of both sides of my mouth here, but here's the deal: no matter how interesting the story might've sounded on paper, how entertaining Troughton's mercurial performance as the Doctor may be, or how pulse-poundingly exciting it was to young British children huddled around their television sets as the 1960s drew to a close, it is insanely boring by today's standards. I felt as though I'd been transported to that Salvador Dali painting with the melting clocks as time dragged by at a pace laughable to even the lowliest of snails as I viewed this show. I thoroughly enjoyed the stylish sets and the cool costumes the T-Mat employees wore. I loved the bulky Ice Warriors who may have been the love children of Cobra Commander and Darth Vader. I didn't even mind when the camera jiggled or when the characters laughed during what was intended to be a terrifying scene. But my god, I felt like I was watching molasses make its way down a gravel road the entire time. I'm not sure if a six-episode arc was the norm during this era of the show, but I'm quite glad they eventually did away with it, as the writers seemed to take full advantage of the excess time they'd been allotted and then some. That said, I wouldn't go so far as to say I didn't like it. As so many former lovers have told their exes throughout time, "It's not you, it's me". I'm quite certain my fondness for exploitation films and Saturday morning cartoons has conditioned me to a somewhat faster paced and more exciting form of narrative, and the more educated and literate Doctor Who fan will find The Seeds of Death to be quite to their tastes. As I said earlier, it's a smart story that probably worked really well in the writing room or when held up to 1969 standards and despite my own personal failure to enjoy it, I won't condemn it either. Much of the enjoyment I did get from Seeds of Death came from Patrick Troughton's portrayal of The Doctor. He's got an impish quality about him and often seems downright distracted at times. There's a serious side to his personality that comes out when it needs to and a comical, panicked aspect as well, but when he meets the old scientist building a rocket in his lab, The Doctor is as giddy as a fanboy at a comic convention. He's like a weird combination of your grandpa, who takes the time to play catch with you and sneaks you an extra piece of cake, and your grandmother who gets frazzled at even the most minor of disturbances. He also sort of reminded me of a kindergarten teacher for the same reasons. At any rate, I dug the guy. And then there are the extras. Whenever I review these Doctor Who DVDs, I silently praise the folks at the BBC who put them together. 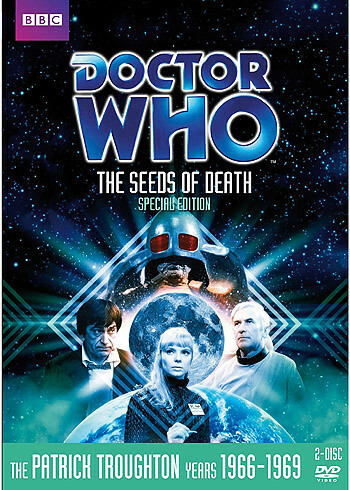 With commentary on the episodes and an entire disc worth of documentaries, The Seeds of Death tops many of the previous Doctor Who DVDs I've reviewed in the extras department. In addition to the "making of" features, there's a great piece comparing the most famous recurring villains of the series that took us all the way to present day and the current incarnation of Doctor Who. As always, I found the extras to be just as interesting and entertaining as the series itself - in the case of this particular series, even more so. In the end, I have mixed feelings about The Seeds of Death. It's worth your while and from a historical perspective, quite important, as many of the episodes from this era have been lost to time. I imagine that if it had been condensed to four episodes instead of six, this might be an entirely different review. As it is, I give it a shaky thumbs-up and probably won't be revisiting it myself any time soon, though I do encourage Doctor Who die-hards to seek it out, as they will no doubt want to add it to their collection.